This week we have a question from my friend Angela. I will post her question and my answer, and hope you will join in with any suggestions or tips in the comments below. Thanks, and love to all! Angela's family lost their precious little dog Teddy recently. 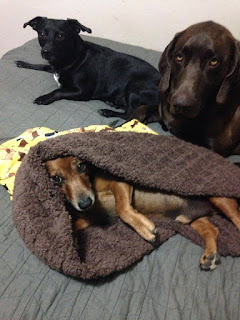 He is the cute little black dog pictured in the photo above (back left). 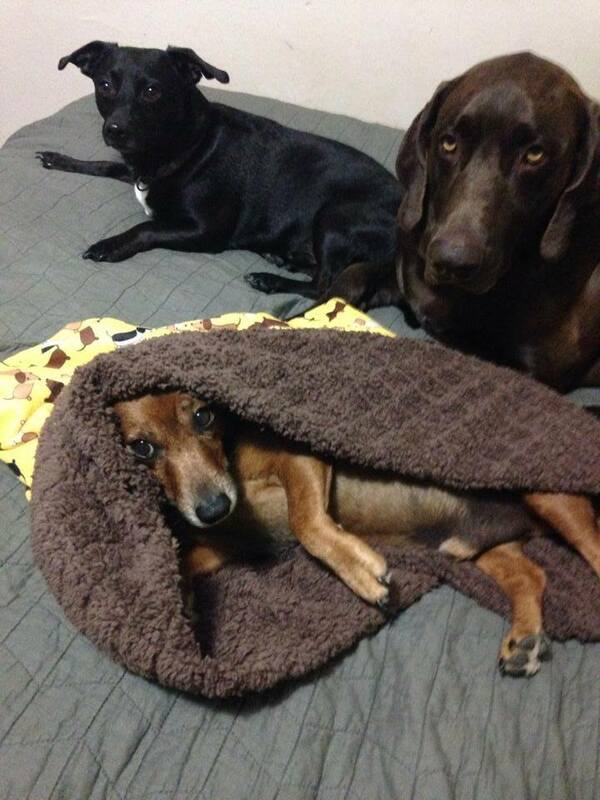 His brothers are Gizmo, the little brown dachshund (foreground), and Sarge, the big sweet dog (back right). 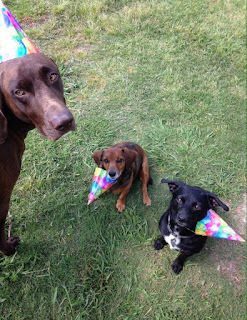 You will find another photo of the brothers together, below: (left to right) Sarge, Gizmo, and Teddy. Angela writes that Gizmo and Sarge are really missing Teddy. "Teddy just provided the energy and enthusiasm. My dad and I were talking about how much the house feels empty without Teddy. He really was a spark plug. Sarge and Gizmo just lay around and act depressed. They get happy for brief moments but other than that, they just lounge around looking morose. That had been my question for Abby. Since she lost a 'brofur' just like Gizmo and Sarge, how did she cope with the loss?" I am so sorry about Teddy. I have heard many stories about him, and know he was a special, fun, lively boy ... and an important part of your family. I lost my beloved brother Barney Fife last September, and I still think about him every day. Momma says we were bonded. I believe this means we loved each other and were inseparable. Yes, that sounds right: bonded. At first it was very hard. Barney went to the vet and he didn't come home. Momma was sad and she cried, and I missed my brother and didn't understand what was happening. After a day or two, I figured it out. I felt sad too. I was very quiet and stuck to Momma like glue. Here are things that helped. Momma told our neighborhood friends about Barney. They gave me extra attention and their dogs socialized with me even more than usual when we met them on walks. Visiting with other dogs was really nice. And about walks -- we started going on extra walks. Lots of time outside! I kept very busy. Being busy helped. Friends and family came over, as they usually do, but they brought treats and toys and gave me lots of extra attention. I liked that. I found a special plush toy that belonged to Barney and I made it my lovie. I still carry it around and snuggle with it, and sometimes like to sleep with it. It reminds me of my brother. Momma gave me extra cuddles and attention, and I liked that too. I did not think that Momma could love me more than she already did, but it seems like that happened. We turned on lights and played music and tried to fill the house with happy noise. We still miss Barney and think of him every day, but more and more we remember the good times spent with him. I am thinking of you both, and your Mom and family too, and sending you many good and comforting thoughts. You have friends and family who loved Teddy and who love you both and want you to be happy again. I hope some of these suggestions help you. Pets become a part of the family and saying goodbye to them is always hard! Thankfully we haven't had to deal with the loss of our dogs yet. These are great tips to help them if one of them passes. Aww :( They feel just as much of the loss as we do. That makes me sad. I really love that you do a Friday feature where your dogs blog. :) I'm hooked! I almost didn't read this when I saw the title. We've had too many losses in too few years. These are great ideas to help a grieving dog. I think humans forget sometimes that dogs grieve about their companions too. We lost our 17 year old kitty about two weeks ago (sorry to bring up cats in this space! ), and I was really worried about her also 17 year old companion. They were together since they were kittens. What has helped him was that we had brought in two kittens from outdoors because of the heat (we feed the neighborhood feral cats), and having them really helped my old cat. He seems to be doing well with his two new young friends. When we lost Norton, Buster (his littermate) was devastated. We knew we needed to do something, quick. Luckily, we found a puppy within a week and when we brought him home, Buster was ecstatic! I wish we had a picture of the look on his face when he spotted the puppy- it was like he said: " A puppy, just for me- Just what I always wanted!" He promptly adopted that baby and proceeded to mother the baby. He was the happiest boy after getting that puppy. I'm sorry for both of your brofur losses. Now I want to go hug my pups. It's so sad when you lose a brofur... I know when our 14 year old silkie passed away last year his little sister was quite confused... she didn't know what had happened. With time she started to feel better and picked one of his toys to) tote around with her (something she never use to do... she would leave his toys alone!). I think the hardest part has been having no one for her to play with, your boys still have each other. They will grieve (as will you) and eventually learn to remember him fondly. Thank you for visiting and for commenting! I am sorry that several of you have had fur family losses too. They are hard. It is wonderful, Kathy and Debbie, that you adopted new furbabies ... I know they have loving homes with you. Thanks so much for sharing your thoughts on this topic with us. I suspect that the grieving dogs are also responding to their human's grief as well. This means they are not only sad at losing their canine companion, but perhaps not sure how to comfort their pet parent. 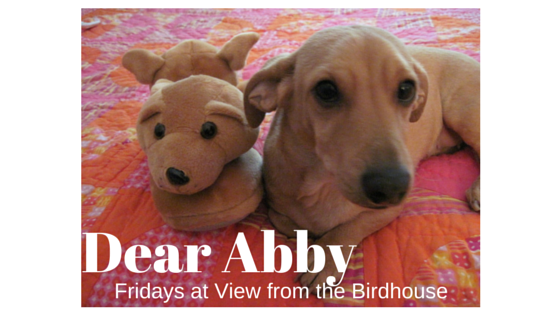 Abby, this leads to another question you might want to address: when is the right time to welcome another pet into the family (after a loss)? When we lost Billy, our hearts were breaking. We heard about Oz needing a home, and knew it was right to welcome him ASAP. We missed Billy, but loved Oz at the same time. Oz helped us a great deal. It was absolutely the right decision for us and Oz. But we did receive some negative comments, which to be honest, hurt us. Abby, can you offer some ideas on this matter? Barbara, thank you for visiting. I agree with you that grieving dogs also pick up on their human's emotions as well. That is a wonderful question -- thank you so much for sending it. Thanks for visiting - I agree with you!